West Bengal Lady Police Constables Recruitment : 2550 Vacancies - Get here complete official notification details, eligibility criteria, selection process etc. 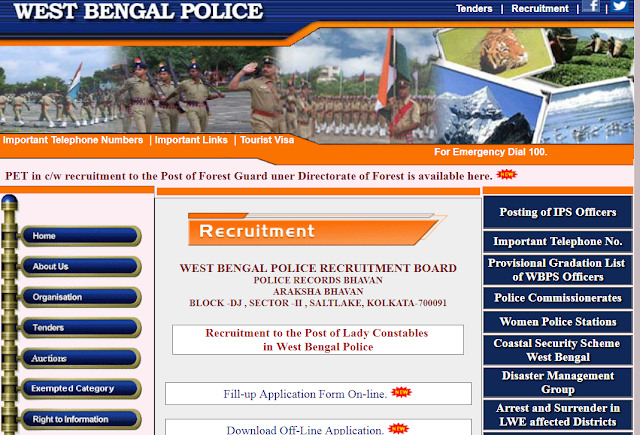 West Bengal Police has released Online Official Notification for Recruitment 2550 vacancies for Lady Constables. Get here eligibility criteria, selection procedure, Pay scales, Qualification, Age limit etc. Last Date of Application : 1st February 2018. Pay Scale: Pay Scale of Rs.5,400 – 25,200/- (i.e. Pay Band-2) + Grade Pay Rs.2,600/-. The following Application fees and/or Processing fees have been fixed. All categories except Scheduled Caste/Scheduled Tribe (of West Bengal only) Application fees - 170 rs. Scheduled Caste/Scheduled Tribe - 20 rs.